In a recent interview curator Domenico Quaranta gives his take on the "so-called surfing clubs generation" and places Nasty Nets, one of the so-called clubs, into a comfortable academic narrative that is about fifty percent fantasy. As an actual, prolific participant in Nasty Nets, and a continuing, prolific participant in its real time chat descendant, dump.fm (which Quaranta seems not to have heard of), and as an early adopter addressing "internet in the gallery" problems (mine was the first show at And/Or Gallery in 2006), I've had a fun time combatting misinformation about these cultural moments (see, e.g., this Q&A). Below is a chunk of the Quaranta interview with some impertinent interruptions. The questions (by Melanie Bühler) are in bold and my comments are italicized. ...In what sense has appropriating content as part of artistic production shifted with the rise of the internet when compared to earlier artistic strategies connected to appropriation? ...Early surfing clubs like Nasty Nets mark the turning point in which artists active online realized that filtering and recontextualizing general web content was more interesting, and more topical, than designing the web. Artists built relationships looking at each other’s delicious account, and were deeply aware of how a simple blog post can be a powerful act of re-framing, as texts such as Kevin Bewersdorf’s “Spirit Surfing” prove. TM: "How a simple blog post can be a powerful act of re-framing" was an issue I'd been dealing with for a few years, as an artist-with-blog, before Bewersdorf's (I felt) overdetermined manifesto. A few simple cues, such as a mildly authorative-looking white page, were sufficient to effect this transformation. I didn't see the need to dress it up with loopy theories about "spirit surfing." What was the context in which Nasty Nets emerged? How does it relate to earlier internet art and is there a relation to what later emerged as post-internet art? The so-called surfing clubs generation shows elements of continuity with and resistance against the former “net.art” generation. TM: Resistance yes, continuity, not so much. Quaranta attempts to normalize Nasty Nets as some kind of bridge or synthesizing movement. 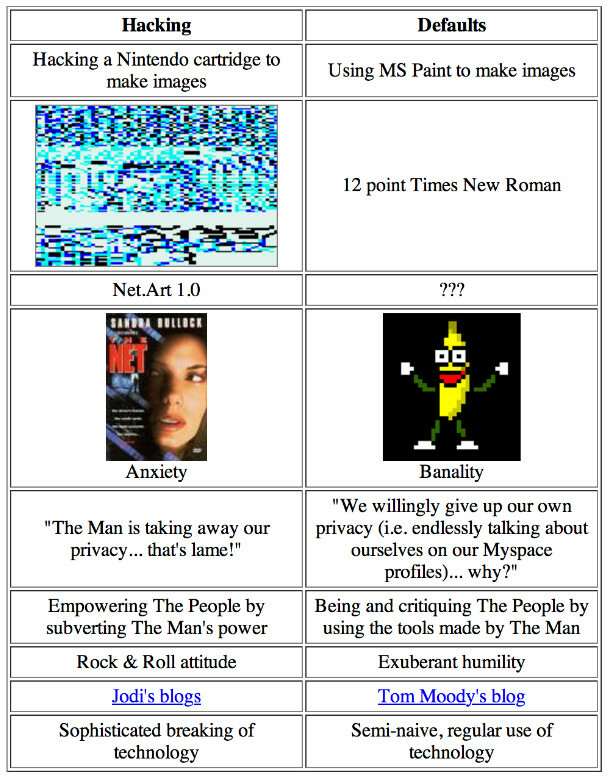 Resistance is made explicit in Guthrie Lonergan’s famous “Hacking vs Defaults” diagram, and is related to the broader shift from Web 1.0 to Web 2.0, from html to blogging platforms, and to the artist’s shift from the position of internet pioneer to amateur user among many others. TM: See the famous diagram and my discussion of it below. Continuity is related to the participation of artists of the former generation, like Olia Lialina, and younger artists grown up in the cult of early net.art, like Cory Arcangel, in surfing clubs; but also to the ability of the former generation to anticipate tastes and topics of the new. TM: Cory Arcangel was never a surf club participant, that's inaccurate. Lialina was invited to join NN seven months after it started. She adapted well to the blog format but was not an innovator of blog-based art, in the sense that, say jimpunk had been with the 544x378 WebTV. There is a lot of interest in defaults in early net.art, too. Many early net.art works deal with appropriation, reframing and the absence of the digital original, and some artists have always been attracted by digital folklore. TM: Unfortunately net.art didn't find a dynamic way to engage an audience with these issues, such as a group blog, but instead relied on links from institutions that told you what you would be consuming and what to expect. Despite Lonergan’s diagram, early net art is not all about “sophisticated breaking of technology” and glitch aesthetics. TM: Quaranta is arguing with Lonergan now! This is partisanship masquerading as an objective curatorial point of view. Lonergan embodies his comparison in the contrast between my blog and JODI's "blogs," a topic Quaranta is completely unwilling or unable to tackle. Also, the surfing club generation, at least at the beginning, shared with net art the interest in the internet as a way to exist as an artist outside of the art world, away from its rules and its contexts. TM: That's not true, you find art references throughout Nasty Nets posts. Several of the members were artists or art school trained. At the same time, the surfing club generation created the conditions for the later shift toward post-internet. TM: Possibly the surfing club generation WAS post-internet. Two of the core features of post-internet — namely, the creation of works that can fit the exhibition space while simultaneously addressing the artist’s experience of the internet, and the importance given to documentation and mediated experience of art — find their roots here. TM: It wasn't a "root" -- we were talking about these issues. It's just that the more interesting, urgent question was "what would a blog-based art look like?" An actual schism over a shift from blog-based art to gallery based art happened later, with Paintfx.biz, which broke up over this issue, as Michael Manning noted in a recent panel. I don't know if I'd call that progress. TM: This wasn't always so true. The response to my 2006 show in Brooklyn, "Room-Sized Animated GIFs," was like, "what's a GIF?" and if you want to resist commodification you can always make fun of the “art object,” e.g. by choosing some cheap print on demand service to materialize a digital file. Artists like Kevin Bewersdorf and Guthrie Lonergan stopped being active as artists when they realized that their practice was, like it or not, bringing them straight into the gallery. TM: Bewersdorf and Lonergan both took hiatuses but are back, with coverage in Rhizome and ArtNews, respectively. Did they pause because "their practice was bringing them straight into the gallery"? We don't know, but it's a good story. TM: One could say that Vvork was a conservative step backward, shifting the focus of a group blog from "the whole world" or at least "the whole internet" to obsession with the narrow confines of gallery-based practice. Some of us noted this at the time. and is related to this generation’s perception of the networked computer as their natural environment, and thus as their main context for any kind of experience, included the experience of art. We could update Picasso’s famous statement saying that, for them, a found online image is better than the Nika; and an online image of the Nika is better than the Nika itself, because it’s ubiquitous, free, easy to share and use, spreadable and loaded with information (tags, metadata etc.). I’m wondering if Brian Droitcour  is aware of how conservative his criticism of post-internet—an art, in his own words, that looks crappy in the gallery and great online—may appear from this perspective. Making an expensive artwork and placing it in a respected white cube for the sole purpose of generating a good JPG may actually be the most corrosive challenge brought by netizen artists to the art world and its values. The gallery is not openly criticized, but subtly abused by turning it into a stage, and insulted by treating it not as a point of arrival, but of departure in an endless process of redistribution. TM: This is a rehash of whether Guthrie Lonergan's phrase "internet aware art" meant art based on the internet or art made ready for the internet, which has been covered extensively here and on Rhizome. Joel Holmberg mentions that many artists whose practices were connected to the internet and surfing clubs like Nasty Nets have moved towards more painterly, visual practices. Would you agree with this and how does this again relate to the label post-internet? As said above, the surfing clubs participants were more interested in images than in codes. While the first net.art generation was, to some extent (and with some exceptions) iconoclastic, the second is, no exceptions, iconophiliac when not even iconolatric. Also, most of them were attracted, since the early days, by the practice of computer drawing, and by the way in which postproduction tools like Photoshop implemented metaphors and gestures taken from reality and from the field of painting. So, no surprise if they kept working on this. But it would be wrong to think that the main motivation behind this move was the will to get in the art market with an easy to get, easy to sell art form. The market success of artists like Petra Cortright, Michael Manning, Jon Rafman and Parker Ito is just the top of an iceberg made of thousands of GIFs, PNGs and JPGs circulated for free online. TM: This is all fine, and I suppose we had to end by talking about someone's "market success." In this recent interview I said that Nasty Nets wasn't concerned with gallery display issues (what is now being called -- ugh -- post internet) but forgot my own post on "gallery hardware." The link was to a blog discussion at digitalmediatree.com/tommoody about a gallery-friendly brand of computer (which is quaint but still needed as most GIF display alternatives are so crappy) and what I was calling digital non-sites. This is all "post internet" by any current flaky definition of the term. Continuing this theme of astonishing clairvoyance, I also had a post in 2006, "Showing new media work in the gallery": what's at stake." This was reblogged by Eyebeam and pronounced "self indulgent but useful," or words to that effect. For that matter, this three part interview that Paddy Johnson did with Michael Bell-Smith and me, titled "Geeks in the Gallery," deals with some of these same issues.